Many housing societies that lie close to the new Islamabad International Airport have seen a dip in demand. This is mostly because of rumours that the new airport is going to be enveloping land from some housing societies for the airport’s future expansion. 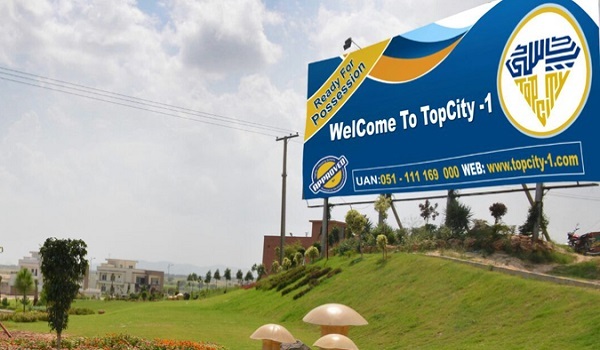 Despite all it has to offer, TopCity-1 has suffered from a drop in demand because of these rumours. Well, I am here to straighten out the facts for you. TopCity-1 is one of the most sought after projects in the area, and for good reason. The project currently comprises eight blocks, i.e. A, B, C, D, E, F, G and H. Block B investors have already been given possession, while development work is underway in Block A, C and D. Dynast Associate, the muscle behind the project, is also planning to launch new blocks i.e. I, J and K. It is expected that 10-marla and 1-kanal residential plots will be launched in the new blocks. The developer has submitted a new master plan for approval to the concerned authorities because of changes that are needed in the older blocks. TopCity-1 has all the ingredients of a good investment, but the rumour mill has hurt sale-purchase activity. The reality is that the new airport does not affect the society at all. Those planning to invest here can make their move without any worries. Click here to read more about the rumours in question. Dynast Associate has already obtained NOCs from the Rawalpindi Development Authority (NOC# PHS/86/113) and the Civil Aviation Authority (NOC# P/C-961). Development work is underway at a good pace in Blocks A, C, and D. In Block A, ground levelling has been completed, and the developer plans to work on sewerage infrastructure next. In the past, there were some issues when land was being acquired for Block A, but the situation has been resolved. TopCity-1 has complete possession of the land that it has put up for investors. Development work is 50% complete in Block A, 80% in Block C and 60% in Block D. It was expected that the developer would hand over possession in Blocks A, C and D in February; however, because of changes in the master plan, possession will now be granted later. Where is the land at? According to Shiraz Manzoor from Pak Associates, an additional 2,800 kanals will be acquired for the new Islamabad International Airport. This land will be acquired in the Pind Rajha area, and TopCity-1 will not be affected by the acquisition. I am expecting property prices to shoot up once the new blocks are launched, and the new airport is inaugurated (the date for which has been set for August 14). That’s all about TopCity-1 for the day. If you want to add something to the information I have provided in this post, feel free to do so in the comments section below.